helpful feature for us. We must add an emergency contact to our phone’s lock screen. There are lot of person lock his smartphone due to many reasons like lost his phone, leak of important data and many more. But sometime at different situations your phone still locked. For eg: When you ridding the vehicle and accidentally your vehicle accident with another vehicle or need any medical help but you are not able to unlock your phone. In that situation nobody able to call your emergency contact number due to lock the phone. To avoid this situation you must have to set an emergency contact number at your screen lock smartphone. You must need to know how to setup an emergency contact on your phone. Step 1: Open the Settings option in your smartphone. Step 2: Tap on the “Security” option which is located in the “Personal” category. Step 3: In Security window tap on the Security button in-front of “Screen lock” option. Now, tap on the “Lock screen message” option and type the required emergency phone number. For eg. “Emergency Call at 8769421656”. Now, save the lock screen message and get back on home screen. You can also edit or remove the lock screen message from you smartphone as per your need. 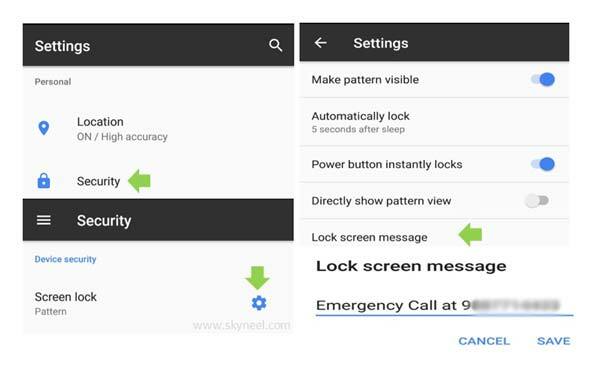 Step 4: Now, when you phone screen is locked and someone press power button given Emergency number shown at home screen of your smartphone. I hope after reading this guide you understand how to add an emergency contact to your Phone’s lock screen. If you have any issue or query regarding this guide then please let me know via comment box. Thanks to all.